Need to updated your wardrobe? Macy's is offering 25-40% Off Contemporary and Designer Women's Clothing & Up to extra 20% with code FALL at checkout. 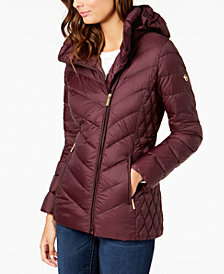 This MICHAEL Kors Hooded Puffer Coat is $127.49 (Retail $190).